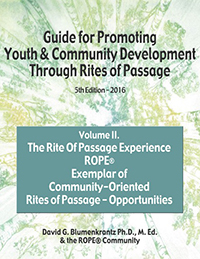 Since 1980 hundreds of thousands of youth and their parents have gone through a community-oriented rites of passage called the Rite Of Passage Experience© ROPE®. This is the 5th edition of the guide that integrates all of the lessons learned. There are 3 volumes to the Guide including approximately 500 pages. 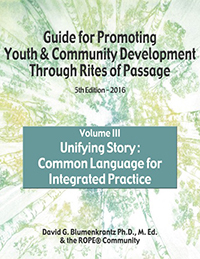 Connecting communities and creating capacity – Lay of the Land – 3 Volumes. Lay of the Land – The guide is broken up into three sections. Reframing therapy as ongoing process of initiation – It can be used to reframe children and youth’s “problems” as an “ordeal” and part of the ongoing process of initiation. It details how to facilitate a process where youth are “co-researchers,” not “patients” or “clients” and partners in resolving issues. The Initiation of Scholars© process that fosters climates of respect in schools while impacting academic performance. Play as secular spirituality and a central ingredient in the 2nd of the 3 – phase of a community-oriented rite of passage is described more fully. Community service – giving to others as characteristic of maturity and expectation for an emerging adult. Tying all of a community’s assets and resources together with ROPE. Click here to learn more about how to “Change the Story – Transform the Future.